This article is about the chemical process. For the cosmetic hair removal procedure, see Electrology. In chemistry and manufacturing, electrolysis is a technique that uses a direct electric current (DC) to drive an otherwise non-spontaneous chemical reaction. Electrolysis is commercially important as a stage in the separation of elements from naturally occurring sources such as ores using an electrolytic cell. The voltage that is needed for electrolysis to occur is called the decomposition potential. The word "electrolysis" was introduced by Michael Faraday in the 19th century, on the suggestion of the Rev. William Whewell, using the Greek words ἤλεκτρον [ɛ̌ːlektron] "amber", which since the 17th century was associated with electric phenomena, and λύσις [lýsis] meaning "dissolution". Nevertheless, electrolysis, as a tool to study chemical reactions and obtain pure elements, precedes the coinage of the term and formal description by Faraday. 1785 – Martinus van Marum's electrostatic generator was used to reduce tin, zinc, and antimony from their salts using electrolysis. 1800 – William Nicholson and Anthony Carlisle (view also Johann Ritter), decomposed water into hydrogen and oxygen. 1808 – Potassium (1807), sodium (1807), barium, calcium and magnesium were discovered by Sir Humphry Davy using electrolysis. 1821 – Lithium was discovered by the English chemist William Thomas Brande, who obtained it by electrolysis of lithium oxide. 1833 – Michael Faraday develops his two laws of electrolysis, and provides a mathematical explanation of his laws. 1875 – Paul Émile Lecoq de Boisbaudran discovered gallium using electrolysis. 1886 – Fluorine was discovered by Henri Moissan using electrolysis. 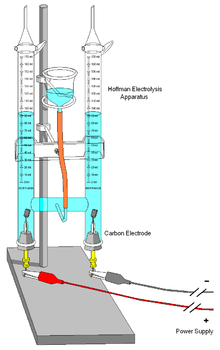 Electrolysis is the passing of a direct electric current through an ionic substance that is either molten or dissolved in a suitable solvent, producing chemical reactions at the electrodes and a decomposition of the materials. An electrolyte: a substance, frequently an ion-conducting polymer that contains free ions, which carry electric current in the electrolyte. If the ions are not mobile, as in most solid salts, then electrolysis cannot occur. A direct current (DC) electrical supply: provides the energy necessary to create or discharge the ions in the electrolyte. Electric current is carried by electrons in the external circuit. Two electrodes: electrical conductors that provide the physical interface between the electrolyte and the electrical circuit that provides the energy. Electrodes of metal, graphite and semiconductor material are widely used. Choice of suitable electrode depends on chemical reactivity between the electrode and electrolyte and manufacturing cost. The key process of electrolysis is the interchange of atoms and ions by the removal or addition of electrons from the external circuit. The desired products of electrolysis are often in a different physical state from the electrolyte and can be removed by some physical processes. For example, in the electrolysis of brine to produce hydrogen and chlorine, the products are gaseous. These gaseous products bubble from the electrolyte and are collected. An electrical potential is applied across a pair of electrodes immersed in the electrolyte. Each electrode attracts ions that are of the opposite charge. Positively charged ions (cations) move towards the electron-providing (negative) cathode. Negatively charged ions (anions) move towards the electron-extracting (positive) anode. In this process electrons are either absorbed or released. Neutral atoms gain or lose electrons and become charged ions that then pass into the electrolyte. The formation of uncharged atoms from ions is called discharging. When an ion gains or loses enough electrons to become uncharged (neutral) atoms, the newly formed atoms separate from the electrolyte. Positive metal ions like Cu2+deposit onto the cathode in a layer. The terms for this are electroplating, electrowinning, and electrorefining. When an ion gains or loses electrons without becoming neutral, its electronic charge is altered in the process. In chemistry, the loss of electrons is called oxidation, while electron gain is called reduction. Reduction of ions or neutral molecules occurs at the cathode. In the last example, H+ ions (hydrogen ions) also take part in the reaction, and are provided by an acid in the solution, or by the solvent itself (water, methanol etc.). Electrolysis reactions involving H+ ions are fairly common in acidic solutions. In aqueous alkaline solutions, reactions involving OH− (hydroxide ions) are common. Sometimes the solvents themselves (usually water) are oxidized or reduced at the electrodes. It is even possible to have electrolysis involving gases. Such as when using a Gas diffusion electrode. The amount of electrical energy that must be added equals the change in Gibbs free energy of the reaction plus the losses in the system. The losses can (in theory) be arbitrarily close to zero, so the maximum thermodynamic efficiency equals the enthalpy change divided by the free energy change of the reaction. In most cases, the electric input is larger than the enthalpy change of the reaction, so some energy is released in the form of heat. In some cases, for instance, in the electrolysis of steam into hydrogen and oxygen at high temperature, the opposite is true and heat energy is absorbed. This heat is absorbed from the surroundings, and the heating value of the produced hydrogen is higher than the electric input. Electrochemical cells, including the hydrogen fuel cell, use differences in Standard electrode potential to generate an electrical potential that provides useful power. Though related via the interaction of ions and electrolysis and the operation of electrochemical cells are quite distinct. However, a chemical cell should not be seen as performing electrolysis in reverse. In 1832, Michael Faraday reported that the quantity of elements separated by passing an electric current through a molten or dissolved salt is proportional to the quantity of electric charge passed through the circuit. This became the basis of the first law of electrolysis. The mass of the substance (m) deposited or liberated at any electrode is directly proportional to the quantity of electricity or charge (Q) passed. In this equation k is equal to the electromechanical constant. where; e is known as electrochemical equivalent of the metal deposited or of the gas liberated at the electrode. Faraday discovered that when the same amount of current is passed through different electrolytes/elements connected in series, the mass of substance liberated/deposited at the electrodes is directly proportional to their equivalent weight. Electrometallurgy is the process of reduction of metals from metallic compounds to obtain the pure form of metal using electrolysis. Aluminium, lithium, sodium, potassium, magnesium, calcium, and in some cases copper, are produced in this way. Production of electrolytic copper as a cathode, from refined copper of lower purity as an anode. Production of oxygen for spacecraft and nuclear submarines. 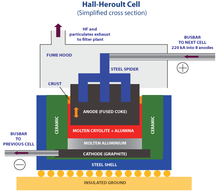 Production of hydrogen for fuel, using a cheap source of electrical energy. Electrolysis is also used in the cleaning and preservation of old artifacts. Because the process separates the non-metallic particles from the metallic ones, it is very useful for cleaning a wide variety of metallic objects, from old coins to even larger objects including rusted cast iron cylinder blocks and heads when rebuilding automobile engines. Rust removal from small iron or steel objects by electrolysis can be done in a home workshop using simple materials such as a plastic bucket, tap water, lengths of rebar, washing soda, baling wire, and a battery charger. Electroplating, where a thin film of metal is deposited over a substrate material. Electroplating is used in many industries for either functional or decorative purposes, as in vehicle bodies and nickel coins. Electrochemical machining (ECM), where an electrolytic cathode is used as a shaped tool for removing material by anodic oxidation from a workpiece. ECM is often used as technique for deburring or for etching metal surfaces like tools or knives with a permanent mark or logo. Using a cell containing inert platinum electrodes, electrolysis of aqueous solutions of some salts leads to reduction of the cations (e.g., metal deposition with, e.g., zinc salts) and oxidation of the anions (e.g. evolution of bromine with bromides). However, with salts of some metals (e.g. sodium) hydrogen is evolved at the cathode, and for salts containing some anions (e.g. sulfate SO42−) oxygen is evolved at the anode. In both cases this is due to water being reduced to form hydrogen or oxidized to form oxygen. In principle the voltage required to electrolyze a salt solution can be derived from the standard electrode potential for the reactions at the anode and cathode. The standard electrode potential is directly related to the Gibbs free energy, ΔG, for the reactions at each electrode and refers to an electrode with no current flowing. An extract from the table of standard electrode potentials is shown below. Oxidized species (often a cation) with a more negative cell potential are more difficult to reduce than oxidized species with a more positive cell potential. For example, it is more difficult to reduce a sodium ion to a sodium metal than it is to reduce a zinc ion to a zinc metal. Reduced species (often an anion) with a more positive cell potential are more difficult to oxidize than reduced species with a more negative cell potential. For example, it is more difficult to oxidize sulfate anions than it is to oxidize bromide anions. the electrode potential for the oxidation producing oxygen is +0.82 V.
Comparable figures calculated in a similar way, for 1M zinc bromide, ZnBr2, are −0.76 V for the reduction to Zn metal and +1.10 V for the oxidation producing bromine. The conclusion from these figures is that hydrogen should be produced at the cathode and oxygen at the anode from the electrolysis of water—which is at variance with the experimental observation that zinc metal is deposited and bromine is produced. The explanation is that these calculated potentials only indicate the thermodynamically preferred reaction. In practice many other factors have to be taken into account such as the kinetics of some of the reaction steps involved. These factors together mean that a higher potential is required for the reduction and oxidation of water than predicted, and these are termed overpotentials. Experimentally it is known that overpotentials depend on the design of the cell and the nature of the electrodes. For the electrolysis of a neutral (pH 7) sodium chloride solution, the reduction of sodium ion is thermodynamically very difficult and water is reduced evolving hydrogen leaving hydroxide ions in solution. At the anode the oxidation of chlorine is observed rather than the oxidation of water since the overpotential for the oxidation of chloride to chlorine is lower than the overpotential for the oxidation of water to oxygen. The hydroxide ions and dissolved chlorine gas react further to form hypochlorous acid. The aqueous solutions resulting from this process is called electrolyzed water and is used as a disinfectant and cleaning agent. The electrochemical reduction or electrocatalytic conversion of CO2 can produce value-added chemicals such methane, ethylene, ethane, etc. The electrolysis of carbon dioxide gives formate or carbon monoxide, but sometimes more elaborate organic compounds such as ethylene. This technology is under research as a carbon-neutral route to organic compounds. Electrolysis of water produces hydrogen. The energy efficiency of water electrolysis varies widely. The efficiency of an electrolyser is a measure of the enthalpy contained in the hydrogen (to undergo combustion with oxygen, or some other later reaction), compared with the input electrical energy. Heat/enthalpy values for hydrogen are well published in science and engineering texts, as 144 MJ/kg. Note that fuel cells (not electrolysers) cannot use this full amount of heat/enthalpy, which has led to some confusion when calculating efficiency values for both types of technology. In the reaction, some energy is lost as heat. Some reports quote efficiencies between 50% and 70% for alkaline electrolysers; however, much higher practical efficiencies are available with the use of PEM (Polymer Electrolyte Membrane electrolysis) and catalytic technology, such as 95% efficiency. NREL estimated that 1 kg of hydrogen (roughly equivalent to 3 kg, or 4 L, of petroleum in energy terms) could be produced by wind powered electrolysis for between $5.55 in the near term and $2.27 in the long term. About 4% of hydrogen gas produced worldwide is generated by electrolysis, and normally used onsite. Hydrogen is used for the creation of ammonia for fertilizer via the Haber process, and converting heavy petroleum sources to lighter fractions via hydrocracking. Thus, this CAWE approach is that the actual cell overpotential can be significantly reduced to below 1 V as compared to 1.5 V for conventional water electrolysis. A specialized application of electrolysis involves the growth of conductive crystals on one of the electrodes from oxidized or reduced species that are generated in situ. The technique has been used to obtain single crystals of low-dimensional electrical conductors, such as charge-transfer salts. Wikimedia Commons has media related to Electrolysis. ^ The Supplement (1803 edition) to Encyclopædia Britannica 3rd edition (1797), volume 1, page 225, "Mister Van Marum, by means of his great electrical machine, decomposed the calces of tin, zinc, and antimony, and resolved them into their respective metals and oxygen" and gives as a reference Journal de Physiques, 1785. ^ Lecoq de Boisbaudran P-E (1875). "On certain properties of gallium". The Chemical news and journal of industrial science. 32: 294. ^ Tilley, R.J.D. (2004). Understanding solids: the science of materials. Understanding Solids: The Science of Materials. John Wiley and Sons. pp. 281–. Bibcode:2004usts.book.....T. ISBN 978-0-470-85276-7. Retrieved 22 October 2011. ^ "Faraday's Laws of Electrolysis: Definition & Equation – Video & Lesson Transcript". Study.com. Retrieved 10 December 2018. ^ "Rust Removal using Electrolysis". antique-engines.com. Retrieved 1 April 2015. ^ a b c d Atkins, Peter (1997). Physical Chemistry, 6th edition (W.H. Freeman and Company, New York). ^ a b c Vanýsek, Petr (2007). "Electrochemical Series", in Handbook of Chemistry and Physics: 88th Edition (Chemical Rubber Company). ^ Lee, Seunghwa; Ju, Hyungkuk; Machunda, Revocatus; Uhm, Sunghyun; Lee, Jae Kwang; Lee, Hye Jin; Lee, Jaeyoung (2015). "Sustainable production of formic acid by electrolytic reduction of gaseous carbon dioxide". J. Mater. Chem. A. 3 (6): 3029. doi:10.1039/C4TA03893B. ^ Whipple, Devin T.; Kenis, Paul J.A. (2010). "Prospects of CO2 Utilization via Direct Heterogeneous Electrochemical Reduction". The Journal of Physical Chemistry Letters. 1 (24): 3451. doi:10.1021/jz1012627. ^ Machunda, Revocatus L.; Ju, Hyungkuk; Lee, Jaeyoung (2011). "Electrocatalytic reduction of CO2 gas at Sn based gas diffusion electrode". Current Applied Physics. 11 (4): 986. Bibcode:2011CAP....11..986M. doi:10.1016/j.cap.2011.01.003. ^ Hori, Y. "Electrochemical CO2 Reduction on Metal Electrodes" (2008) pp. 141–153 in Modern Aspects of Electrochemistry, ed. C.G. Vayeanas, R. White and M.E. Gamboa-Aldeco, Springer, New York, no. 42. doi:10.1007/978-0-387-49489-0_3 ISBN 978-0-387-49489-0. ^ Appel, Aaron M.; Bercaw, John E.; Bocarsly, Andrew B.; Dobbek, Holger; Dubois, Daniel L.; Dupuis, Michel; Ferry, James G.; Fujita, Etsuko; Hille, Russ; Kenis, Paul J.A. ; Kerfeld, Cheryl A.; Morris, Robert H.; Peden, Charles H.F.; Portis, Archie R.; Ragsdale, Stephen W.; Rauchfuss, Thomas B.; Reek, Joost N.H.; Seefeldt, Lance C.; Thauer, Rudolf K.; Waldrop, Grover L. (2013). "Frontiers, Opportunities, and Challenges in Biochemical and Chemical Catalysis of CO2 Fixation". Chemical Reviews. 113 (8): 6621–6658. doi:10.1021/cr300463y. PMC 3895110. PMID 23767781. ^ Qiao, Jinli; Liu, Yuyu; Hong, Feng; Zhang, Jiujun (2014). "A review of catalysts for the electroreduction of carbon dioxide to produce low-carbon fuels". Chem. Soc. Rev. 43 (2): 631–675. doi:10.1039/C3CS60323G. PMID 24186433. ^ Carmo, M; Fritz D; Mergel J; Stolten D (2013). "A comprehensive review on PEM water electrolysis". Journal of Hydrogen Energy. 38 (12): 4901. doi:10.1016/j.ijhydene.2013.01.151. ^ Zittel, Werner; Wurster, Reinhold (8 July 1996). "Chapter 3: Production of Hydrogen. Part 4: Production from electricity by means of electrolysis". HyWeb: Knowledge – Hydrogen in the Energy Sector. Ludwig-Bölkow-Systemtechnik GmbH. Archived from the original on 7 February 2007. ^ Levene, J.; Kroposki, B.; Sverdrup, G. (March 2006). "Wind Energy and Production of Hydrogen and Electricity – Opportunities for Renewable Hydrogen – Preprint" (PDF). National Renewable Energy Laboratory. Retrieved 20 October 2008. ^ Ju, Hyungkuk; Badwal, Sukhvinder; Giddey, Sarbjit (2018). "A comprehensive review of carbon and hydrocarbon assisted water electrolysis for hydrogen production". Applied Energy. 231: 502–533. doi:10.1016/j.apenergy.2018.09.125. ^ Ju, Hyungkuk; Giddey, Sarbjit; Badwal, Sukhvinder P.S. ; Mulder, Roger J. (2016). "Electro-catalytic conversion of ethanol in solid electrolyte cells for distributed hydrogen generation". Electrochimica Acta. 212: 744–757. doi:10.1016/j.electacta.2016.07.062. ^ Giddey, S.; Kulkarni, A.; Badwal, S.P.S. (2015). "Low emission hydrogen generation through carbon assisted electrolysis". International Journal of Hydrogen Energy. 40: 70–74. doi:10.1016/j.ijhydene.2014.11.033. ^ Ju, Hyungkuk; Giddey, Sarbjit; Badwal, Sukhvinder P.S. (2018). "Role of iron species as mediator in a PEM based carbon-water co-electrolysis for cost-effective hydrogen production". International Journal of Hydrogen Energy. 43 (19): 9144–9152. doi:10.1016/j.ijhydene.2018.03.195. ^ Bechgaard, K.; Carneiro, K.; Rasmussen, F. B.; Olsen, M.; Rindorf, G.; Jacobsen, C.S. ; Pedersen, H.J. ; Scott, J.C. (1981). "Superconductivity in an organic solid. Synthesis, structure, and conductivity of bis(tetramethyltetraselenafulvalenium) perchlorate, (TMTSF)2ClO4". Journal of the American Chemical Society. 103 (9): 2440. doi:10.1021/ja00399a065. ^ Williams, Jack M (2007). "Highly Conducting and Superconducting Synthetic Metals". Inorganic Syntheses. Inorganic Syntheses. 26. pp. 386–394. doi:10.1002/9780470132579.ch70. ISBN 978-0-470-13257-9.